The Pacific Southwest Railway Museum Association is a non-profit educational organization dedicated to the preservation and interpretation of railroads as they existed in the Pacific Southwest. With over 120 pieces of equipment and artifacts on display between our two facilities in Campo, CA and La Mesa, CA, the Pacific Southwest Railway Museum Association provides a unique learning experience for all ages. At our Campo facility, we offer vintage train rides with locomotives and cars from the early 20th century operated by our all-volunteer train crews and support staff. For a full listing of the train rides, please visit our Master Train Rides Calendar and purchase your tickets today! Your purchase of tickets on our train rides goes directly towards preserving the Pacific Southwest Railway Museum Association's collections and supporting its ongoing educational programs. Become a member to help preserve our railroad history! By joining the PSRMA, you'll enjoy the many benefits membership including free train rides, discounted gift shop purchases, a free copy of our "Hot Scoop" current events news letter, early access to special event train ride tickets, and much, much more. The Pacific Southwest Railway Museum and the historic La Mesa Depot are maintained and operated by a 100% volunteer staff. These dedicated men and women help to preserve the Association's museum grounds for the future. We need your help to keep our museums alive. 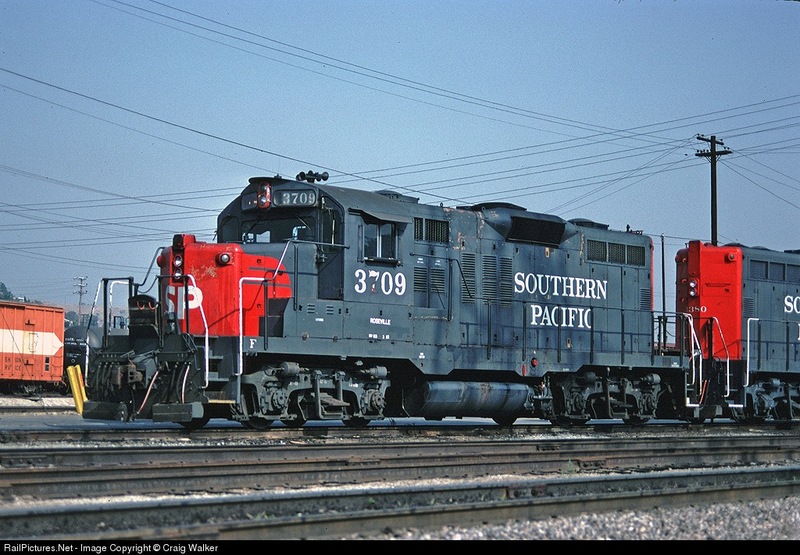 We are excited to announce that PSRMA has been awarded a $13,000 dollar grant to be used towards purchasing new starting batteries and engine lubricating oil for our low-nosed Southern Pacific GP-9 #3709. Among many other projects in the Mechanical Department, we hope to restore this locomotive to operable condition over the next few years. You can read more about the legacy of John H. Emery at emeryrailheritagetrust.org/WP/grants-for-2019. The Museum Services Department has teamed up with the Facilities Department at our Campo Railroad Park & Museum site to construct the Athey Mine town for our Mine Train exhibit. New member Jim Tewksbury has stepped forward to lead the effort to create the western town. Jim has created western towns at both his home in Descanso and his new home in Alpine. The town will include several mines which will depict various time periods of mining as the Mine Train passes by. Donations are being solicited for materials to be used in this effort, with several substantial donations already received and transported to Campo! Donations needed include lumber, corrugated tin for siding and roofs, old cedar fencing and old machines which would be commonly found in and around mines. In addition, we need more volunteers to step forward to assist in constructing the town. Our work is expected to last many months, with work days during various weekdays and weekends scheduled in advance. If you can donate your time, please let Jim Lundquist know so that you may be notified of our upcoming work days in Campo. No specific skills are required, as we can use all willing hands. If you can donate time or materials, contact Jim Lundquist via email (best) at Jim@psrm.org, or call at 619-417-7059. Thank you for your assistance in making our newest exhibit come alive. SD&A’s 100th Birthday Celebration Begins Now!